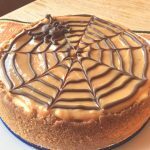 Before you get started making a Cheesecake, please read this article, Perfect Pressure Cooker Cheesecake Tips & Guide, to learn to make Perfect Cheesecake. 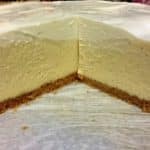 This article on Perfect Pressure Cooker Cheesecake Tips will guide you though the steps, so that you can make Perfect Cheesecake in your Pressure Cooker. Pictures courtesy of my readers! 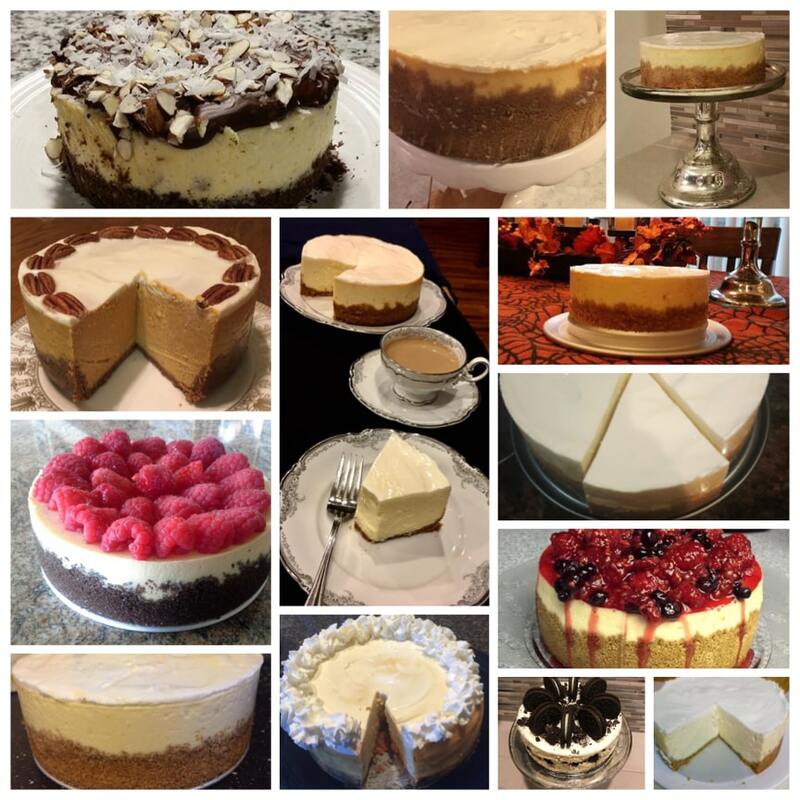 All the completed Cheesecakes in this article, are Cheesecakes made by my wonderful readers. Their Cheesecakes are gorgeous! Many thanks to all those who submitted photos to be used in this article! For the best Cheesecake, brand does matter. I have tested several store brands and there is a significance difference to using Philadelphia Brand Cream Cheese. While your Cheesecake will still taste great with an off brand, the taste will be far superior using Philadelphia Brand. The first thing you will need to do for a smooth and creamy texture, is to allow your cream cheese and eggs to get to room temperature. Beating a fat, such as cream cheese or butter until it’s soft, light and airy is called creaming. If you add eggs right from the fridge to a creamed fat, it’ll cause the fat to re-solidify, making the batter look lumpy or curdled. The eggs don’t need to be room temperature, but taking the chill off of them helps keep the fat from hardening again. 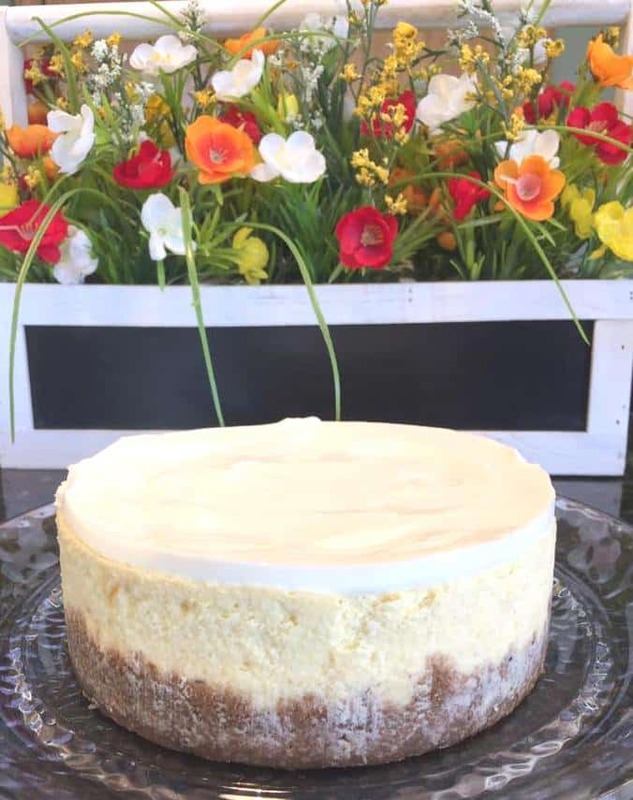 So, at least 30 minutes before you plan to assemble your cheesecake, remove the cream cheese and eggs from the refrigerator and allow them to come to room temperature. If you live in a cooler climate, try putting your cream cheese and eggs into your oven, with the oven light on. Another warmer place in the house, is on top of your dryer. Choose your Cheesecake Pan. For Hard Anodized, my preference is the Fat Daddio’s Push Pan for several reasons. I like the smaller foot print, which means that I can put a larger pan into my Pressure Cooker. I also find it easier to clean than a Springform Pan because of the locking mechanism. The only down side to a Push Pan, as I see it, is that the sides won’t come out as clean looking as they do using a Springform Pan. The pushing action in releasing the Cheesecake, will ‘smudge,’ for lack of a better word, the sides of the Cheesecake, as you can see in the first photo. That being said, this Fat Daddio’s Push Pan is my go-to Cheesecake Pan. 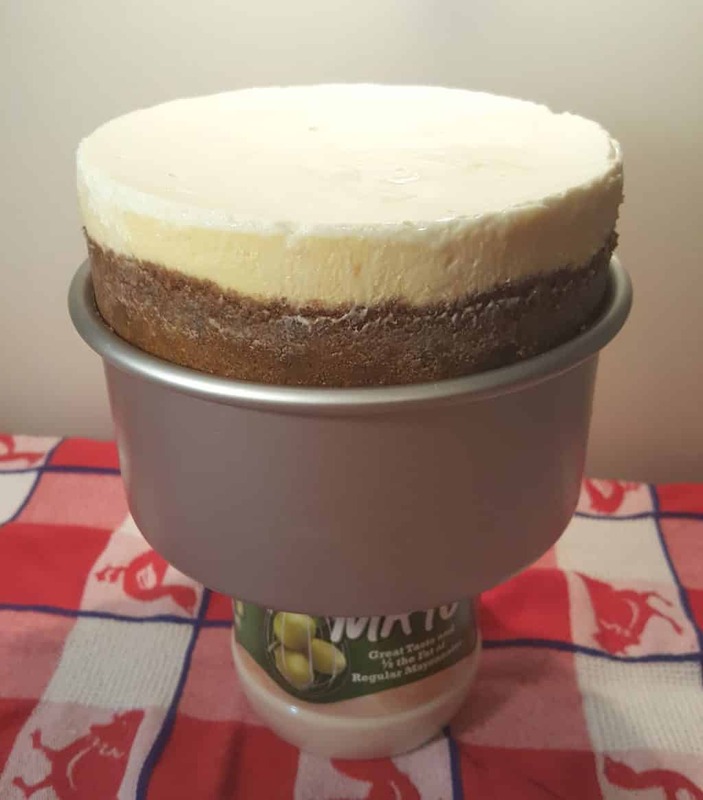 The advantage of a Springform Pan, is that you can easily unlatch the pan and the rim will come right off and leave a nicer side to the Cheesecake. I still suggest using use Parchment Rounds for this option. The latch bothers me. I wonder what is lurking inside the slide part, that I cannot see. I’m a clean fanatic, so I think about stuff like that. The third option and it may be the best of both Worlds, is this new Instant Pot Springform Pan, which is new on the market. The base is made of glass, which is nice, as you won’t have to worry about scratching it on removal of the Cheesecake. The only downside, as I see it, is that you will need to add 5 more minutes to your cook time, as Silicone does not conduct heat as well as the Anodized Aluminum. But, it is a small price to pay in exchange for SILICONE! No aluminum. The sides easily release. As much as I love my Push Pan, this is one I would like to try! The price tag makes it very competitive, so if you try this new Cheesecake Pan, let me know what you think. 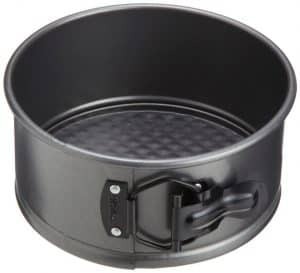 I prefer to use a 6 inch Fat Daddio’s Push Pan over a Spring Form Pan, because clean up is so very easy, but some people prefer a Spring Form Pan. It is very important to generously grease the sides and bottom of your Cheesecake Pan. I also grease the Parchment Round. This will help in the removal of your Cheesecake. Many people leave their Cheesecake in the Cheesecake Pan overnight. If you don’t have parchment, don’t worry. It just might be a little more difficult to separate the cake from the bottom of the pan. Press crumb mixture into pan using a Fox Run Tart Tamper or your fingers, forming a neat border around the edge and slightly up the sides. Place your pan into the freezer for at least 20 minutes, while preparing the filling. Making the crust for a cheesecake is very simple. Crispy cookies, graham crackers, Ritz Crackers, all work well. You can buy cookie crumbs, but it is just as easy to crush them yourself. I use my 11 Cup Food Processor to crush my cookies. Crusts usually just consist of cookies, sugar and butter. 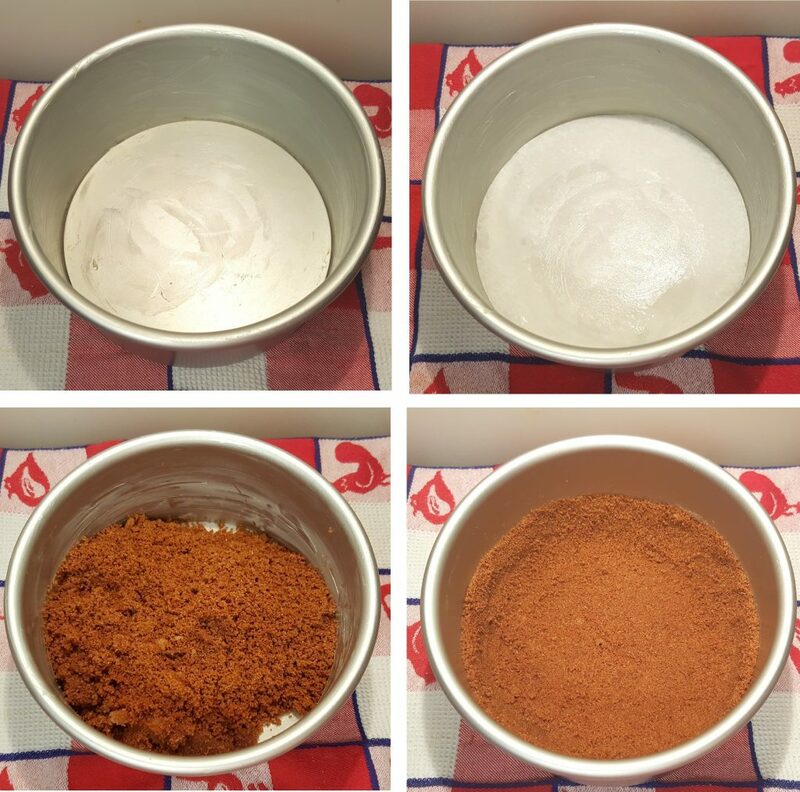 Some recipes will use nuts, spices and extracts. 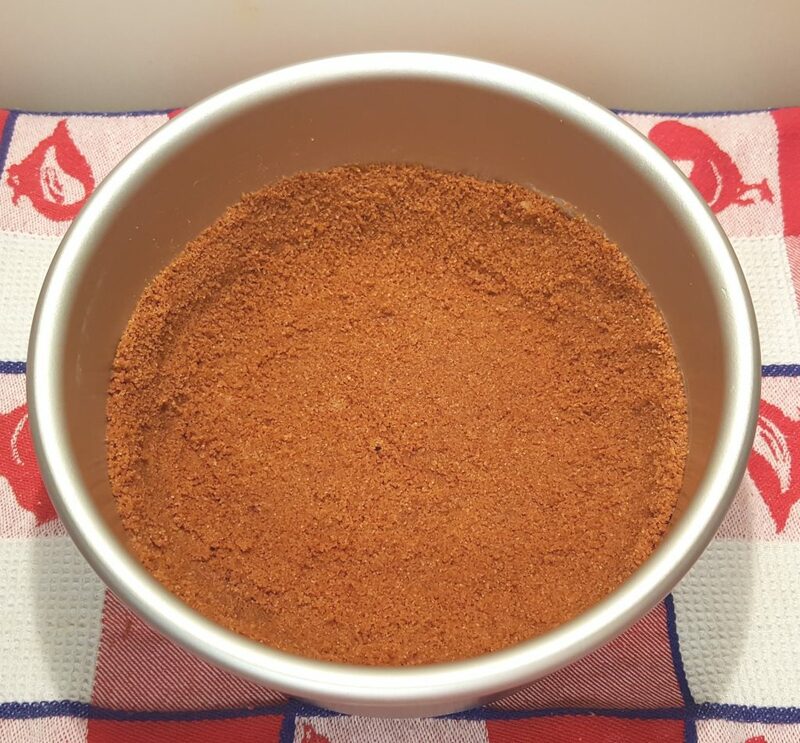 Make sure to add your dry ingredients first and process until you have crumbs. Then add the melted butter and any extracts called for in your recipe. If you don’t have a Food Processor, take a large baggie and put the cookie crumbs inside and seal the baggie. Then use a rolling pin, heavy spoon or other hard object and crush the cookies. This part is very, very important. Do not press the crumbs too high on the sides. If the crust is exposed, the water from the Pressure Cooker will seep into the crumbs and cause a gummy crust. In addition, it will cause excess moisture/condensation to form in the filling itself. At this point, you can either bake the crust in a 350 degree oven for 10 minutes, or, you can simply put the Cheesecake Pan with the crust into the freezer, while preparing the filling. Some people feel they get a crispier crust using the oven, but it really is not that much of a difference. The wet environment in the Pressure Cooker won’t actually keep the crust super crisp. Plus, if you want to do a “Pressure Cooker Cheesecake,” why also use the oven? If you are going to turn on your oven, you might as well use it for the whole shebang. If you prepare your Cheesecake properly, there is no reason not to have a crisp crust. Beating a fat, such as cream cheese or butter until it’s soft, light and airy is called creaming. 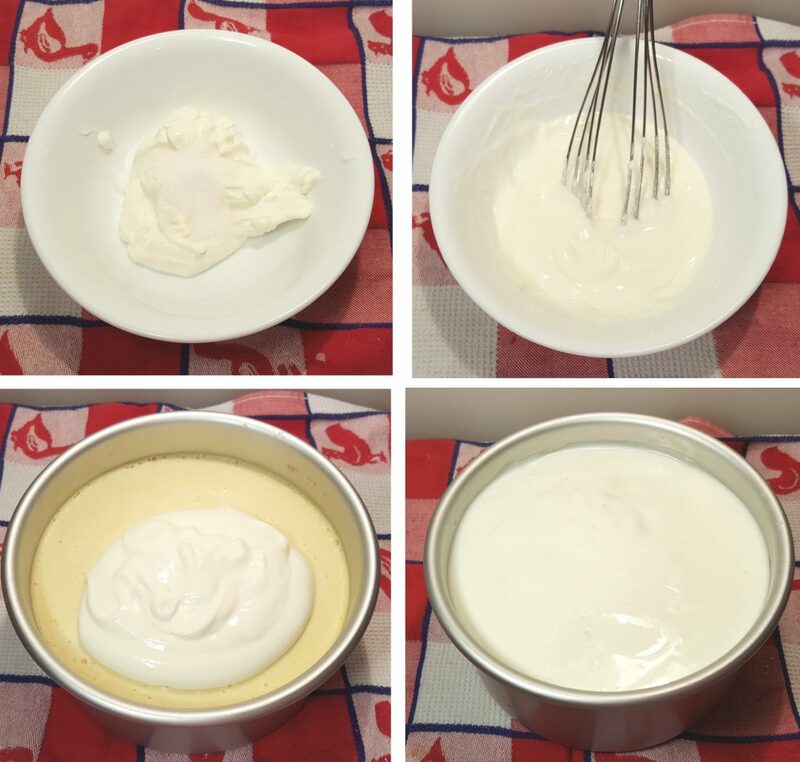 To address lumps in your Cheesecake Filling – If you add eggs right from the refrigerator to a creamed fat, it will cause the fat to re-solidify, making the batter look lumpy or curdled. So, taking the chill off of the eggs will keep the fat from hardening again. 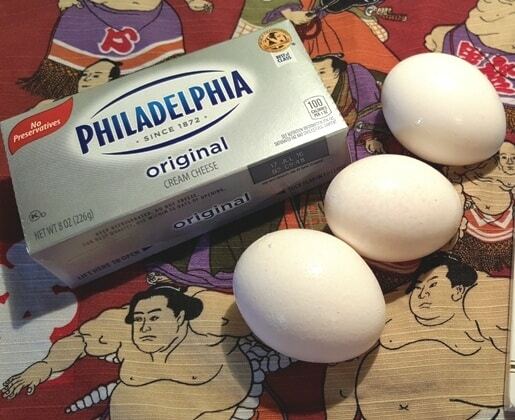 Just take out your eggs at the same time as you do your cream cheese. Make sure not to overmix the filling after you have added the eggs. Once you are ready to add your eggs, add just one egg at a time. If using a Food Processor, just use the pulse button for one to two seconds after each egg added. 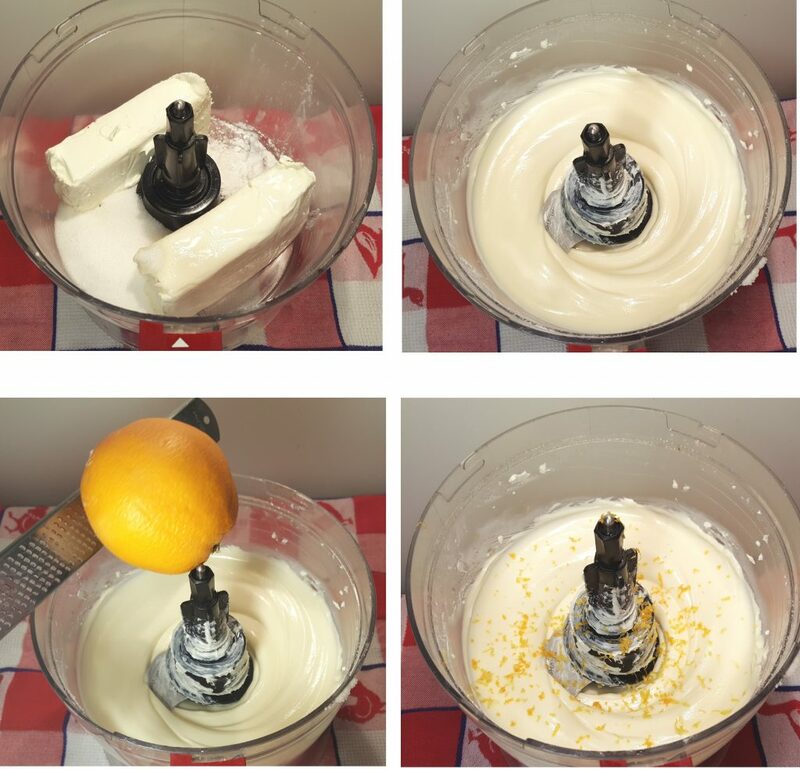 If using an Electric Hand Mixer, push the button on and off and on again, until the egg is partially mixed into the filling. 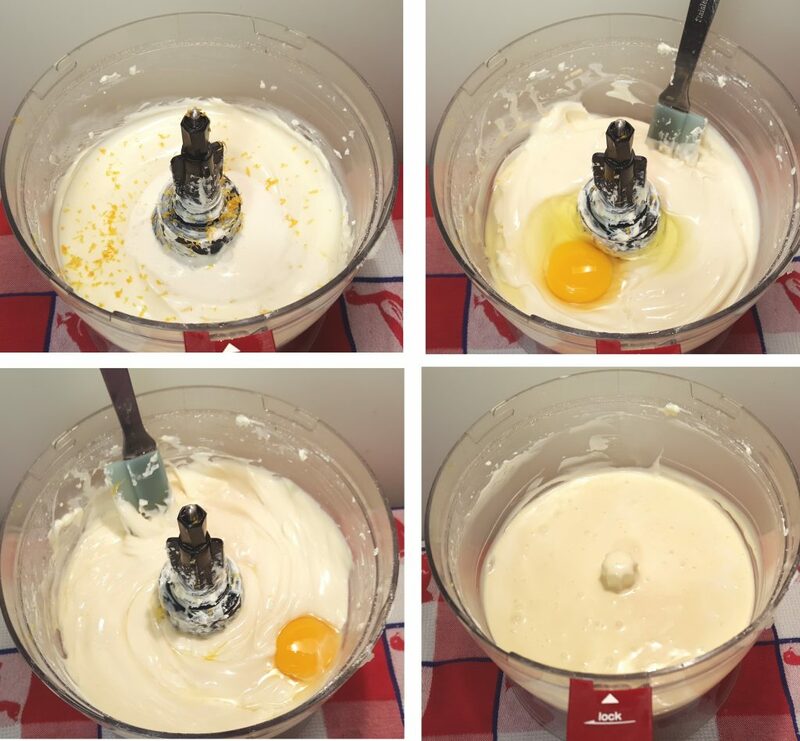 If mixing my hand, just mix until the egg is almost blended. It is okay if you see some of the yellow yolk. Take a spatula and gently fold it into the filling. Over mixing the eggs, will cause the cheesecake to become very airy and will puff up like a soufflé while cooking. It can also resemble scrambled eggs. You can see in the above photo, that there is no crust showing. This is what you want. Hold the pan with both hands and jiggle it a bit to help release any excess trapped air bubbles. You can also tap on the sides of the Cheesecake Pan to help release air bubbles. If you still have a few little bubbles on the surface, use a toothpick or a fork and run it through the bubble to release the air. 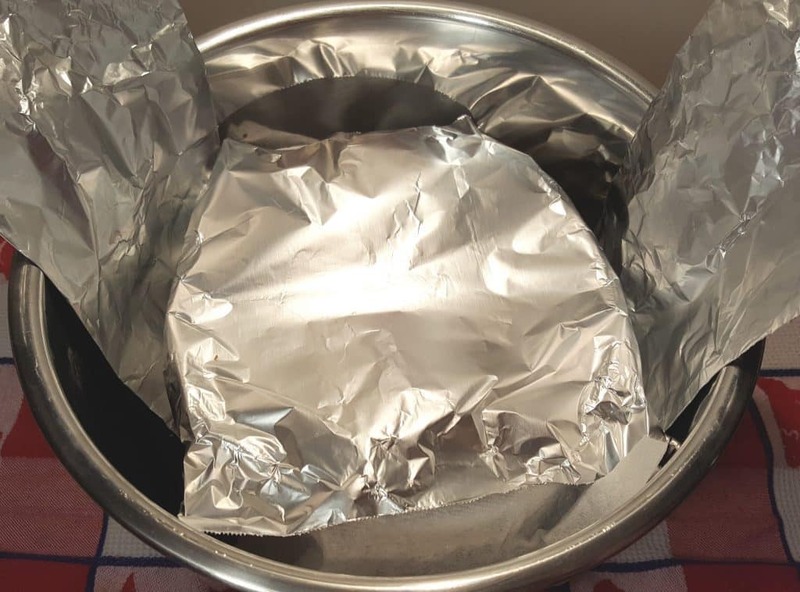 I like to cover my cake pan with a paper towel and with a piece of foil, to eliminate water from landing on the cheesecake. The foil is there, just to make sure the paper towel does not fall into the cake, or blow off. The foil should be on loose and not secured all the way around. If any moisture does end up getting on the cake, just dab it off with a paper towel. Never, ever, ever, never ever, preheat your Pressure Cooker, when making any cheesecake, or when making any of my recipes! All my recipes take into account, the time the Pressure Cooker takes to come to pressure. The Grafiti Bands Cross Style make it so easy to get pans and bowls in and out of the Pressure Cooker. They will hold the paper towel in place nicely. 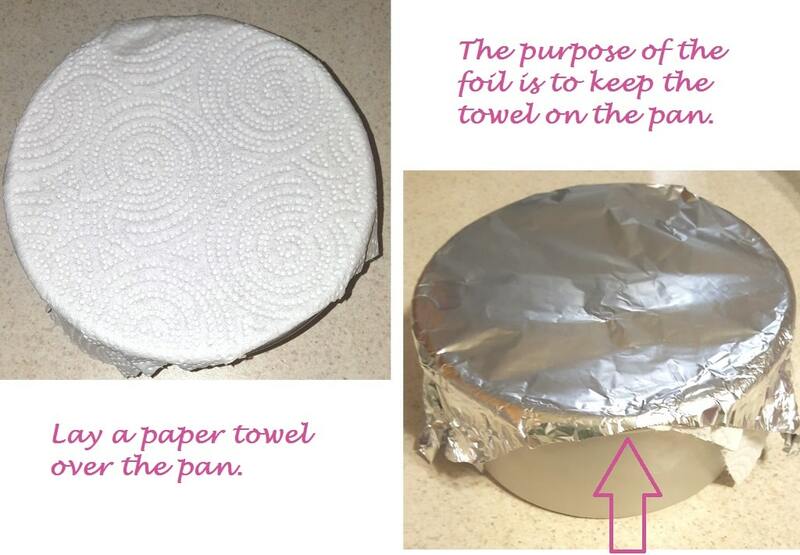 You can put the paper towel and foil over the bands, so slip it underneath, if you are careful. 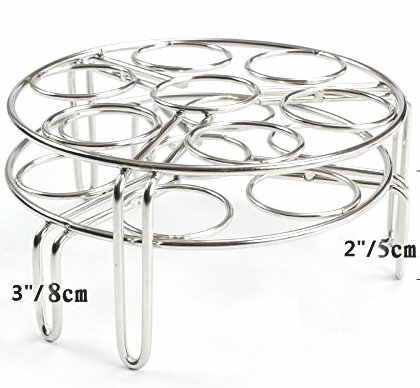 I really like this Trivet Set, as the two different heights are perfect and serve many uses. 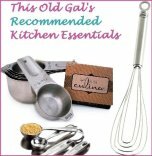 The shorter Trivet is used for making my very popular New York Cheesecake, Hard Boiled Eggs, “Baking Cakes,” etc. The taller Trivet is perfect for making your entrée, a Pot in Pot meal, using my Pressure Cooker Perfectly Cooked Pot in Pot Rice recipe. Potatoes, carrots and other items, fit nicely in your Instant Pot or Pressure Cooker. You can see that the foil and paper towel are not tightly secured on to the Cheesecake Pan. This is good! The smell of food cooked in your Pressure Cooker, often times stays in the Silicone Gasket, that is found in the lid. The odor can transfer to your Cheesecake. It is a good idea to keep one Silicone Gasket that you only use for desserts. I have several Silicone Gasket and use one for strong flavors, one for mild flavors that don’t linger and then one for desserts. So, if you have an extra Silicone Gasket, make sure you remember to use it when making Cheesecake. 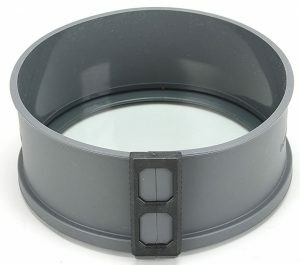 Make sure your Silicone Gasket is probably situated inside the lid of your Pressure Cooker. Always check to make sure your Pressure Valve is Closed. If it is not Closed, all the water in your Pressure Cooker cooking pot will escape and your Cheesecake will not fully cook. Allow the Cheesecake a minimum of 15 minutes Natural Pressure Release. This means, do nothing. When you hear the Beep of the Pressure Cooker, do nothing. After 15-20 minutes, all pressure should be released. Turn the Pressure Valve, to release any remaining pressure and then open the Lid. 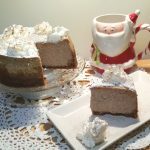 You can see that the Cheesecake is the same height as when we first put it into the Pressure Cooker. Cheesecakes don’t rise and fall, like a regular cake. If yours does, that is because the eggs are over worked, which will cause the rise, cracking, brown areas and then the cheesecake will fall. A cheesecake is done before the center of it is set. It will be a bit jiggly in the center (only about an inch) and the sides will be slightly higher. Jiggly means that there is some movement in the top center of the cake. It does not mean that there is liquid in the middle. There should be NO liquid at all. Don’t feel the urge to cook longer or else the top will crack. Tilt the cheesecake a bit and use a paper towel to remove any condensation/water that got trapped under the foil during cooking. ****** Also, notice that when tilted, nothing is running out of the center and there is no sluffing of the cake whatsoever. This is a perfect jiggle. However, if your Cheesecake has more than an inch of movement in the center, put the cheesecake back into the Pressure Cooker for and cook for 5 more minutes ,or more as needed. Under no circumstances should you end up with the final, chilled product, having a liquid center. All you have to do is cook it longer! If you see any liquid in the center, cook your Cheesecake for 3 more minutes. Make sure to do another 15 minute Natural Pressure Release. The heat that is trapped inside will continue to cook the center while the cheesecake cools on the counter. 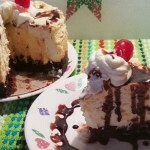 You must leave your Cheesecake on the counter or inside the Pressure Cooker for at least one hour. Don’t rush this process by putting your Cheesecake in the refrigerator or in cooler conditions. A Cheesecake needs to cool down slowly, to make sure that the middle continues to cook and set up properly. If your Cheesecake calls for a Sour Cream Layer, here are some helpful tips to get a glass like top. Whisk together Sour Cream and sugar. This is the Completer Layer. It is not a topping. 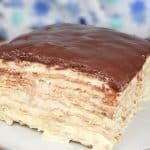 Please don’t skip the Sour Cream Completer Layer, even if you plan to add a topping. This Completer Layer will melt into this Pressure Cooker New York Cheesecake and will become one with the cake. It will add an additional layer of really yummy flavor! 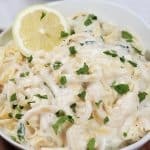 Alternatively, instead of Sour Cream, you can use Homemade Greek Yogurt mixed with sugar, instead of the sour cream, if you happen to be a yogurt maker. You may need a touch more sugar though. This is a challenge for you sour cream haters. I dare you to mix up the sour cream and sugar anyway, even if you hate sour cream. Take a small taste. Ah ha! I bet after pouring it top of your hot cheesecake, you are licking the bowl! 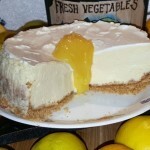 Pour the Sour Cream Layer onto the hot Cheesecake and spread it evenly over the whole cake. 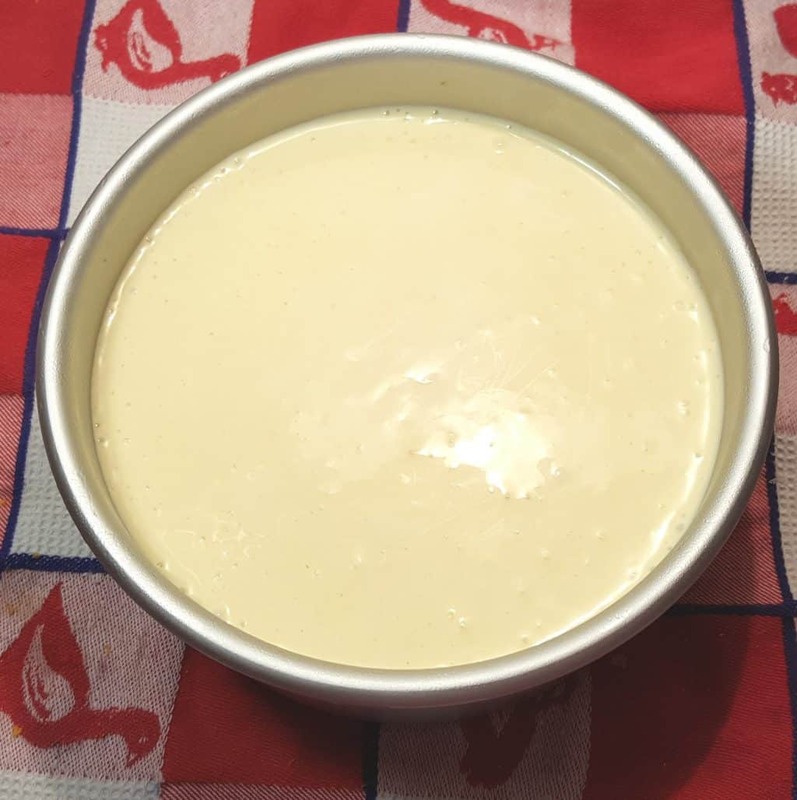 Look how nice and flat this Pressure Cooker New York Cheesecake has become in just five minutes. It is a perfect outcome. 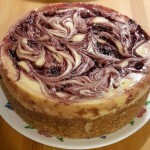 So, after 15 minutes you will notice the Completer layer is melding with the cake and the Cheesecake is flat and glossy. If you put the Cheesecake into the refrigerator to soon, the Cheesecake will be loose in the center. The hour or longer rest on the counter is allowing the Cheesecake to gently finish baking. The Cheesecake will start to pull away from the Cheesecake Pan, which is good. 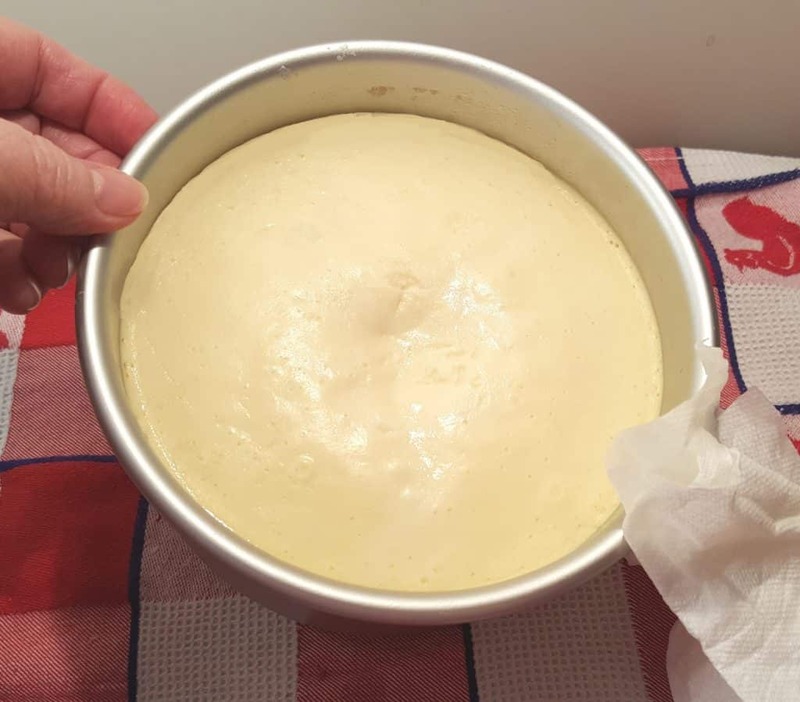 The slow cooling method, first during Natural Pressure Release and then on the counter, allows the Cheesecake to pull away, without getting stuck to the sides and possibly cracking. I usually remove my Cheesecake from the Cheesecake Pan after about an hour or two of being in the refrigerator. It is your choice. If you are nervous about doing this so soon, put the Cheesecake into the refrigerator as is and then when completely chilled, remove the Cheesecake from the Pan. Leaving the Cheesecake in the Pan overnight is fine. If you have properly greased the sides of the pan, the Cheesecake should pull away. 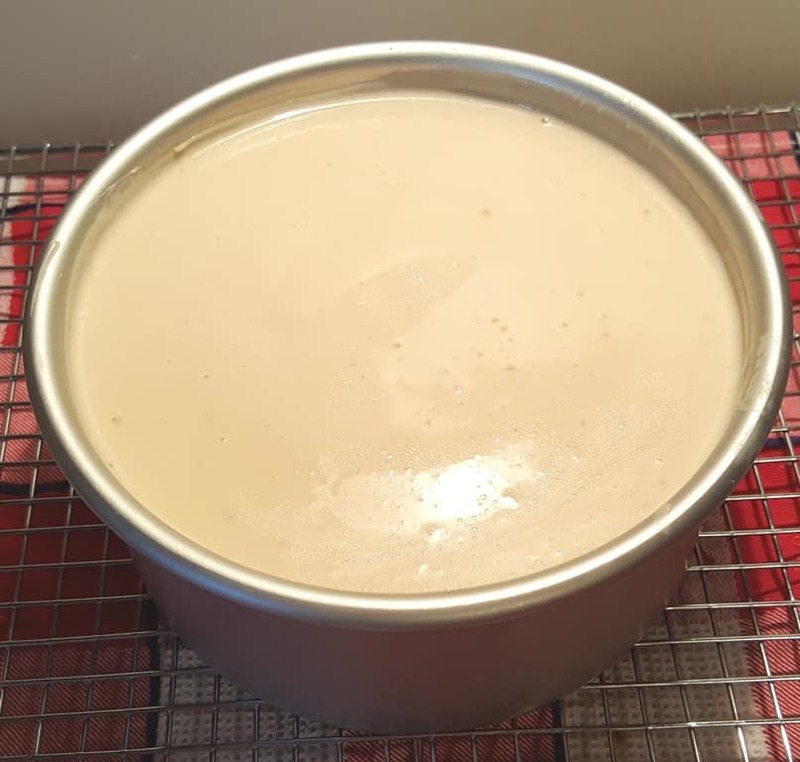 If the pan was not greased enough, the Cheesecake will stick and will cause cracking from the pulling the Cheesecake wants to do, during cooling. 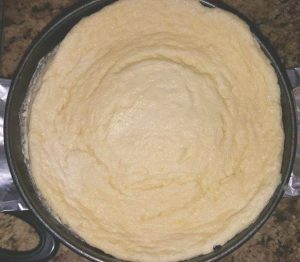 If the Cheesecake is not pulling away, after refrigeration, you will notice that the butter/grease will harden and it may be more difficult to remove the Cheesecake from the pan. A thin silicone spatula or knife run around the edges of the Cheesecake will help. Frankly, I just use force and pull the sides of the pan from the Cheesecake. I’m not overly concerned about the sides. You will see that the Sour Cream Layer, has melted into the Cheesecake and should be flat like glass. It will taste much, much, much, better. Really, I am not joking. Your Cheesecake will taste good on the same day, but will taste incredible the next day. 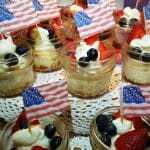 Using Parchment Rounds will allow you to easily life the Cheesecake off the Base. I use this LamsonSharp Chef’s Slotted Turner to remove the cheesecake to a plate. It’s super thin and fits easily between the Cheesecake and the base of the pan. The Parchment Round, peels right off the cake. I’m always getting asked about transporting a Cheesecake Here is a great way to travel with a 6 inch cheesecake. 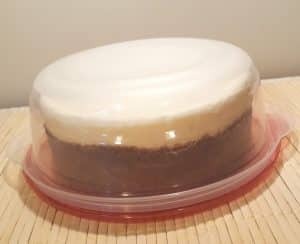 Try using these Rubermaid Disposable Containers to travel with your Cheesecake. 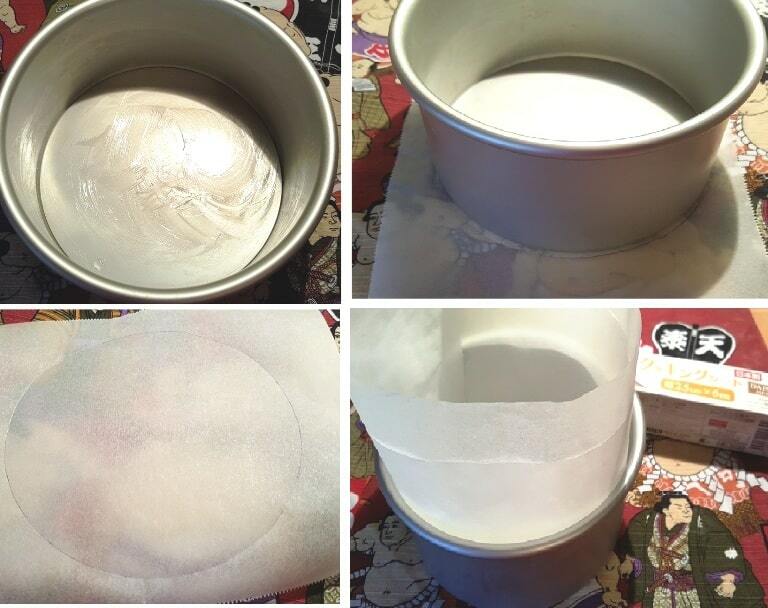 Use the lid as the base for the cheesecake (see New York Cheesecake recipe for photos) and the bowl as the cover! The Containers are cheap enough not to worry about brining the Container home! Cheesecakes freeze really well. I like to slice up the Cheesecake and place a piece of waxed paper in between each slice. Then I place the whole Cheesecake into a Round Lock & Lock and store in the freezer. Easy, peasy. 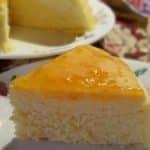 When you want a piece of Cheesecake, just remove a slice and in 30 minutes, you’ve got yummy Cheesecake! 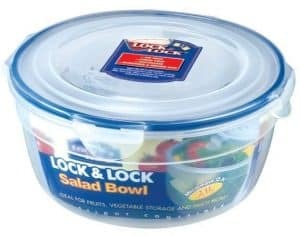 Lock & Lock is BPA free and a high quality airtight container. I use Lock & Lock for all my pantry items too. 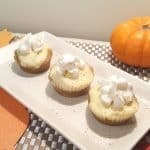 You’ve probably noticed them in many of my recipe photos. 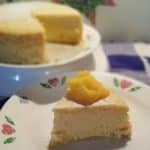 I hope this Perfect Pressure Cooker Cheesecake Tips & Guide has made you confident to make your own Pressure Cooker Cheesecake. 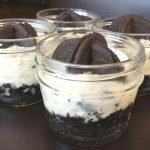 After reading this Perfect Pressure Cooker Cheesecake Tips & Guide, check out these Pressure Cooker Cheesecakes. 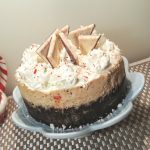 Add some Perfect Homemade Whipped Cream to your Pressure Cooker Peppermint Milkshake Cheesecake. 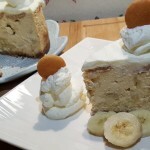 Let me know if this Perfect Pressure Cooker Cheesecake Tips & Guild has helped you to make a Perfect Pressure Cooker Cheesecake. 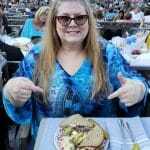 Hi Jill, So excited to find your page. I just got the 6 quart Ultra. I read on a FB page to also order a few “must haves”. 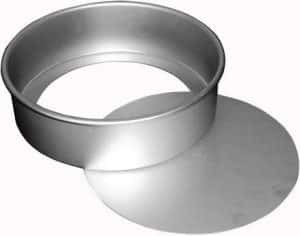 I ordered the 2 piece egg / trivet set, extra seals, 2 of the 7″ x 3″ Fat Daddio push pans and those silicone molds to make egg bites. Is this tips page a printable page? It is full of great tips. I would love to print it out for a go to reference sheet. How many different cheesecake recipes have you come up with? The pictures are making me hungry! Thanks for all of the great information! 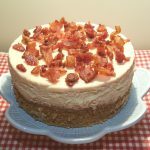 Can you tell me if the cheesecakes can be made in a stovetop pressure cooker ? Are the timings interchangeable for the stovetop pressure cooker and the InstantPot? Don’t understand. You say to get the tips and I can’t find how and somehow I got the New York cheesecake recipe printed out. I really don’t know how. I don’t want to do any thing illigal, but find that there is nothing plainly stated on how to do this. I got the 6″ springform pan and am anxious to bake this cheesecake. But really would like a printed copy of your tips. I can’t tell you how grateful I am that you took the time to write this. I have never seen this information anywhere else and I can see how it will make a world of difference. I’m off to give it a try. I read this while waiting for the eggs and cheese to warm up. Thank you SO much again for this article. 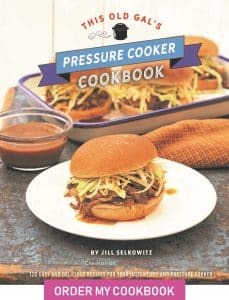 Can you use an XL Pressure cooker ? If so what setting do you use? Hi! I have a 7 inch Fat Daddio’s cheesecake pan. Will your recipe for the New York Style cheesecake work in this size pan…thank you. I made the cheesecake. 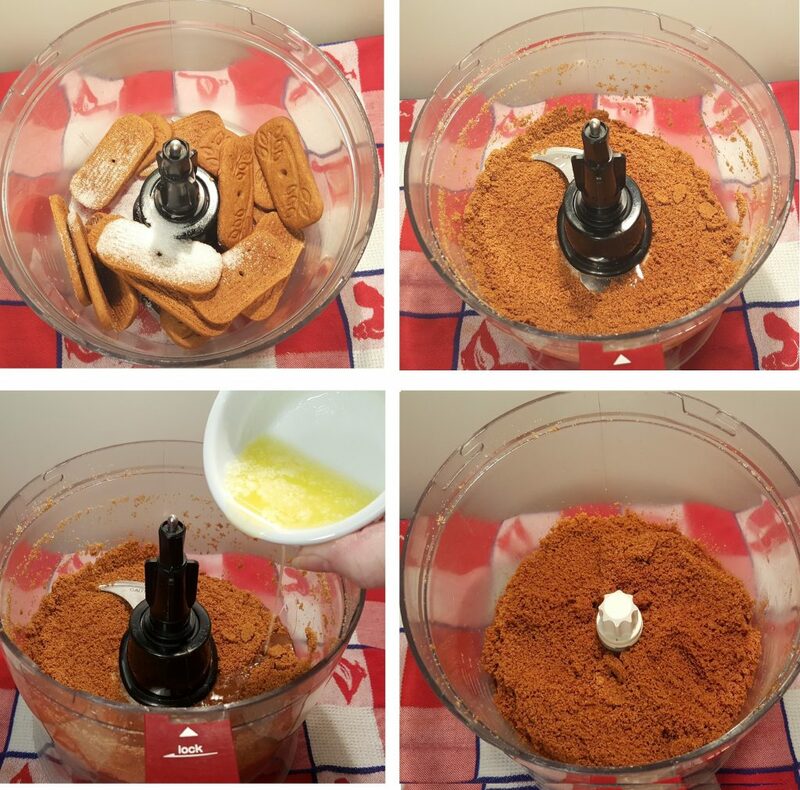 I used a hand mixer in a deep bowl to pulverize the graham crackers, which was a terrible idea because cracker pieces flew all over the counter and floor. So I had to make a little extra. Instead of adding 2 eggs and one egg yolk, I mistakenly added 2 eggs and both the yolk and white of the third egg. It made no difference; the cake came out dense and delicious. I also forgot to add a round of parchment paper on the bottom of the pan. To remove the cake I ran a length of dental floss between the bottom of the cake and pan and the cake slid off cleanly. 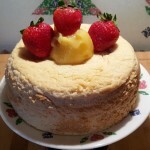 I thought it was a lot of work for such a small cake, but the cake is so rich that I cut narrow pieces and serve with fresh berries on the side and itt serves quite a few. 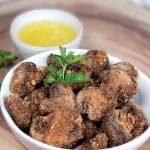 Jill, this recipe is a winner! Can I sued freezer paper or wax paper instead of parchment paper? Recipe was outstanding and easy to follow. Used tofu (fake) cream cheese and sour cream. Tasted awesome. Substituted heavy cream for coconut milk. Huge hit! A few people have asked me for recipe, but they don’t have a pressure cooker. They’re wondering if they can bake this in oven? If yes, at what temperature and for how long? Awesome recipe. Made 6″ cake with tofu (fake) cream cheese and sour cream. Used coconut milk instead of heavy cream. HUGE hit! Two thumbs up! Thank you for sharing this on www. A few people have asked me for the recipe, but don’t have pressure cookers. Can they bake this recipe in a regular oven? If yes, at what temperature and for how long? Read all the comments to make sure this hadn’t been asked. What changes need to be made for using the jars instead. I was thinking of using the little glass jars from the French yoghurt I bought. Do you still do the paper towels on top of the jars? Does the cooking time change? Thanks for any response or suggestions. Having trouble figuring out what size pot you use for the cheesecake…6 or 8 quart? I can’t find a pan that fits my 6 qt t.
Besides cry, what should I do if I accidentally did a quick release instead of NPR? 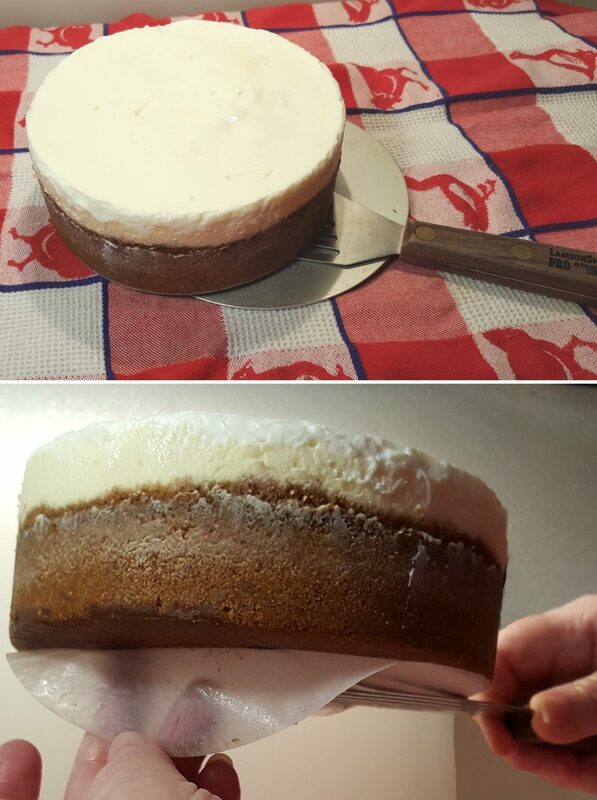 Absolutely solved all the problems I encountered with making a “perfect” Cheese Cake. Thanks so much for the details. Thank you for a great set of tip! But, I did not see any info about how to adjust for different sized IPs or pans. I have an 8 quart instant pot and an 8″ Fat Daddio push pan. Should I double the batter? Or reduce the cooking time? Your cheesecake looks yummy. How do you keep the crust from getting soggy? I made your cheese cake awhile back and it was great. 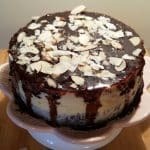 What advice to you have If I wanted to modify this recipe so that I could add both peanut butter and chocolate to make a “Reeses Peanut Butter Cup” cheesecake. It sounds great to me. You mention in your cheesecake guide using Grafiti Bands X Cross style to help make it easier to lift pans out of the IP. I love this idea, but curious what is the correct size to order to fit around a Fat Daddio 7×3 pan. I don’t want to buy a large assortment of sizes I won’t use. Thanks! 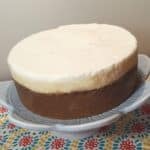 Does the cheesecake need to be covered while cooling in the refrigerator overnight? Thanks for all the info. 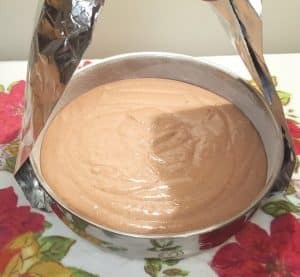 I am new to trying to make a pressure cooker cheesecake. When I tried at the top of my cheesecake was not nice and smooth like yours is there anything I can do to fix this problem ? Thanks! I have an 8qt duo and an 8″ pan. 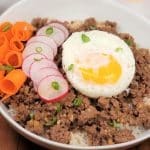 How much better should I increase and how long do i cook?